HDconvert.com is a free online media converter that helps to convert many popular format audio video files using preset output formats. It allows to convert media files into mkv, mp4, mov, flv, avi, 3gp, wmv, ogg, mp3, aiff, and in flac format. For each format, you will be able to select the quality level: low & medium, which is a good feature about this online media converter. Thus, you can convert media files for your smartphone, TV quality, and for other devices. It can even extract audio from video files. 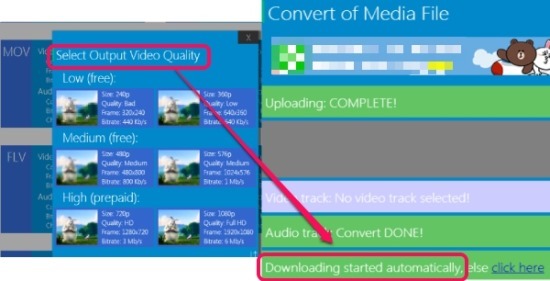 But one media file at a time can be converted with HDconvert.com. You can directly convert media files without any sign up, using this cloud-based online media converter. However, if you will sign up to HDconvert.com, then you can get more features (1 hours VIP access) which will be available for you only for an hour. Features such as desktop notifications for uploaded & converted file, create HD (1080p) videos etc. will be provided to you. If you will be satisfied with this VIP access, then you can upgrade to HDconvert.com, or can continue to use it with free plan. A cloud-based and completely free media file conversion service using which you can convert audio to audio, video to video, and video to audio. Drag n drop support to quickly add a media file for conversion. 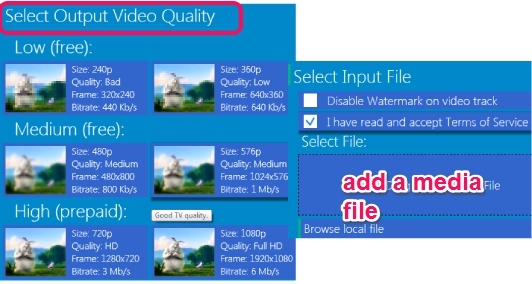 Preset audio video output formats are available based on low, medium, and high quality. You can work with it without any registration process. However, signing up lets you avail benefit of vip access, like convert videos in HD quality and receive desktop notifications for uploaded and converted file. These notifications will be helpful when you have minimized your browser. 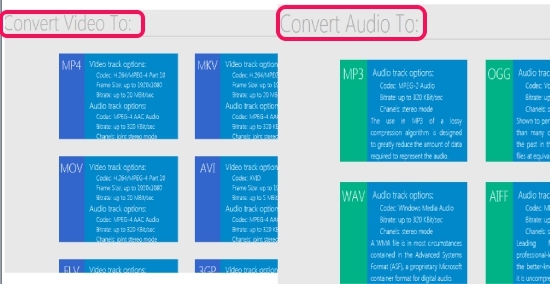 How To Use This Free Online Audio Video Converter Service? Simply access homepage of HDconvert.com and select any output video format or audio format. Its homepage link is present at the end. As visible in screenshot below, you can choose ‘Convert Video To‘ option to convert PC video into any supported video format. Or else, if you want to extract audio from video file, or audio file into another audio format, then you can select ‘Convert Audio To‘ option. Each option provides you preset output formats with low, medium, and high quality. Low & medium quality output can be used without any sign up process and for free. Once you have selected an output format, you can add media file from PC to convert it. Uploading a file may take some time. Once file is uploaded, your media file will be converted & downloaded to PC automatically. HDconvert.com is handy to convert audio video files without using any audio video converter software. It is helpful for all users as preset output formats with output size, quality, and bitrate are available.